The name Santa Maria di Leuca was given by the ancient Greek sailors who came from the East. They saw this place lightened by the sun and therefore called it “leukos”, meaning white. The rest of the name comes from the landing of S. Pietro from Palestina. It came out from several testimonies that he started his evangelization process just here, also changing the name of the city dedicating it to the Virgin. The name “De finibus terrae” comes from the Romans. 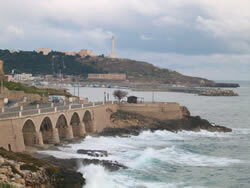 Santa Maria di Leuca is a seaside resort and a fishing area. It is located in the inlet between Punta Ristola and Punta Meliso and rises in a magic position where the Adriatic Sea and the Ionic Sea meet. It is a pearl of the extreme strip of Italy and is located on a part of the coast alternated by cliffs and small sandy coves. Its several grottos have an historical and naturalistic interest and its marine sounding-depth are a real paradise for underwater tourism. Its inland is full of history and culture, wonderful landscape to be admired, magnificent and colourful villa of the nineteenth century that slope down towards the sea-front. A staircase of 184 steps links the Basilica with the below harbour framing the Acquedotto Pugliese that flows into the sea. It was started in 1906 but, with the outbreak of the First World War the works had to stop. The erecting yard reopened after the war and in 1939 the marina was reached. The monumental staircase and the column were sent by the “Duce” of Rome. The waterfall was reopened several times in sixty years. A career abroad, higher studies or just a yen to learn a foreign language can push you towards searching for proceed here for more a good language school.